The French Minister of State for Development and Francophonie, Jean-Marie le Guen, declared yesterday that ‘France will act against any attempts at commercialisation of education’ in international cooperation. He added that France considers that ‘education is a public service’ and ‘a common good that cannot be profited from’. 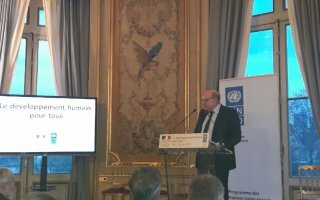 Mr Le Guen made this declaration during the launch of the United Nations Development Program’s (UNDP) annual Human Development Report. This stance constitutes a major commitment from France in a context of massive privatisation and commercialisation of primary and secondary education throughout the world, particularly in poor countries. It notably differs from Great Britain’s stance on the matter, which promotes the development of private schools through its development cooperation aid, by financing in particular multinational corporations with British investments, such as Bridge International Academies. In November 2016, more than 300 civil society organisations from 38 countries presented the Francophone civil society call against commercialisation of education. This Call convinced Heads of States and Governments of the Francophonie countries to ask the International Organisation of La Francophonie (IOF), in the Antanarivo Declaration, to ‘take measures to promote efficient institutional mechanisms for the regulation of private actors in education, in order to ensure quality and equity of education services’.